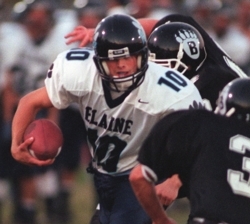 Matt Hendricks was a senior, and he had just been knocked out of Blaine’s opening game of the season. The initial diagnosis: broken collarbone. Hendricks was the sort of player who would rather chew broken glass than miss a shift, so he was none too happy about the news. Matter of fact, he refused to accept it. “(The trainer) seemed to think I had broken my collarbone,” Hendricks said. “I think it was a partial dislocation. With the trainer momentarily out of the locker room, Hendricks took it upon himself to salvage his season. Pain be damned. “The trainer told him, ‘Hang tight here, I’ll be back in a little bit,’ ” said Steve Larson, Blaine’s co-head coach that season. “So when she comes back, he has his hands between his knees, and he’s pulling on his shoulder trying to relocate it. Hendricks was forced to sit out two weeks as his shoulder healed. A few weeks after returning to the lineup, he dislocated his other shoulder. And still he played on. “He still put points on the board,” Larson said. “He still got it done. No one ever knew about it because he never revealed it. He never told anyone else. Centering a line with Trevor Frischmon and Chad Smith, Hendricks scored 23 goals and added 30 assists as a senior in 1999-2000. Also a standout in football (he played quarterback) and baseball (he was a catcher, of course), Hendricks' bulldog mentality played an integral role in the Bengals erasing the memory of a bitterly disappointing finish to the previous season. 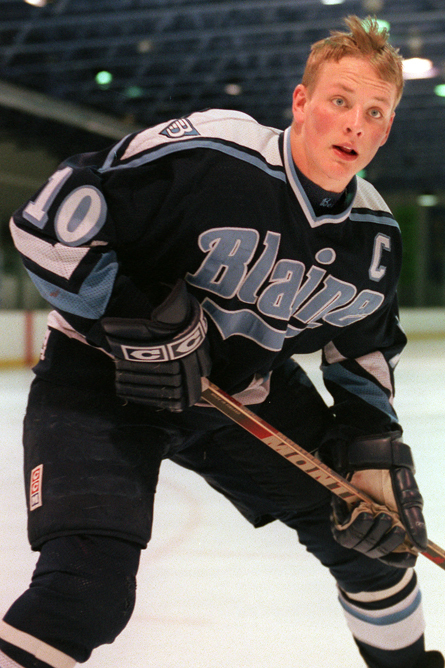 Blaine was leading Hastings 6-5 in the final minute of the 1999 state Class 2A quarterfinals when the Raiders’ Dan Welch scored twice in the final 41 seconds. Welch’s second goal came with one second remaining to give Hastings the 7-6 win. Blaine went on to beat Hill-Murray and Eden Prairie for the consolation title. The Bengals were unimpressed with the hardware they brought home. “You are so excited to play in the sate tournament,” Hendricks said. “We were the late game that night (against Hastings). You go back to the hotel, and you have to play at Mariucci (Arena) the next day at 10 a.m.
With Hendricks anchoring one line and fellow senior Brandon Bochenski scoring at an equally frenetic pace on another, the Bengals breezed through the Section 4AA playoffs to earn a return trip to the Target Center in Minneapolis. "I always knew what our opposing goalies were getting themselves into when they played us" said Steve Witkowski, Blaine's goalie in 2000. "Matt would just keep coming and coming at you. I don’t think Matt knew how to go behind the net. "For us as a team, we just fed of that. His intensety was just contagious to our whole team. It just fueled us." Hendricks scored a goal as Blaine eased past Rocheser Mayo 4-1 in the quarterfinals, setting up a semifinal rematch with Hastings. This time the Bengals prevailed 4-3, with Hendricks notching two more goals. Toughness? Scott Bjugstad, Blaine's co-head coach with Larson, ran across all manner of tough guys during his nine-year NHL career. He never saw a player like Hendricks. "When he was injured he actually played better," Bjugstad said. "It was a weird thing, almost as if he liked it. He would get cut, and then he would come to me and say, 'Hey, Bjuger, look at the blood on my face. "He was one of a kind." Hendricks tacked on two more assists in the championship game as Blaine routed Duluth East 6-0. “I think we were the underdog going into that game, at least that’s what the papers were saying,” said Hendricks, who was named to the all-tournament team for the second consecutive year. After a standout four-year career at St. Cloud State, Hendricks turned pro and played parts of six seasons in the minor leagues before reaching the NHL with the Colorado Avalanche in 2008-09. He played 56 games with the Avalanche in 2009-10 and 77 games for the Washington Capitals last season.